Hello and welcome to exampundit. 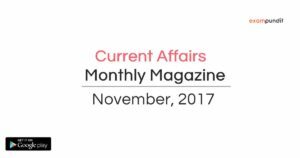 Here is the Monthly Current Affairs Magazine of November, 2017. A big thanks to all EPians for supporting us throughout. The Monthly Current Affairs Magazine contains all the important Current Affairs from Banking, Financial, Defence, Appointments, Sports & all other sectors. We recommend this magazine for upcoming RBI Assistant Mains & IBPS Clerk Mains examination. Give your thoughts, suggestions in the comment section. Don’t forget to attempt our Free Sectional Tests for IBPS Clerk.